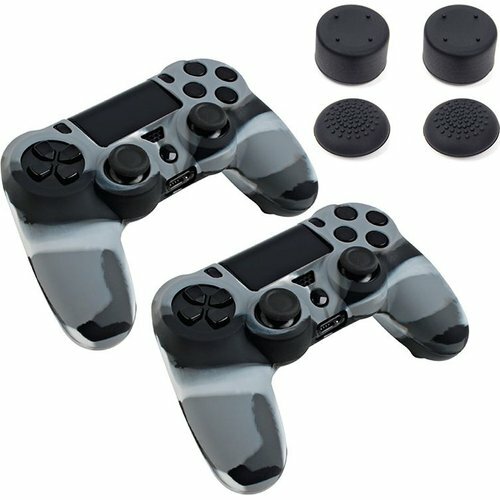 Made From HIGH QUALITY SILICONE, Soft rubber Material, which MINIMIZE SWEAT to help constant play with these controllers. PRECISE OPENING for all functions, as analog stick, touch sensor pads, speaker hole and other buttons, so you could enjoy playing all games without removing the skin. PROTECTS CONTROLLER with normal drops and scratchs during use. This super thin silicone allows the vibration of controller felt adequately to support prompt responose on Speeding and action games. 4 pieces of convex grips. 2 low and 2 high thumb grips provide different levels of leverage and precision. Each set may best suit a particular type of games. Offers added comfort and control for your official PS4 controller. High-quality durable rubber thumb grips. Simply attach to your PS4 controllers analogue sticks. More control & precision. Increased control leads to greater accuracy in gaming.